Event/inspiration: “Murumbung Yurung Murra Cultural Tours” - celebrating indigenous culture. Sophie designed her arrangement to welcome to our country the many visitors that will visit Canberra to celebrate the 100th birthday of our nation’s capital. Her arrangement pays tribute to the “Ngunnawal people” whose traditional lands encompass Canberra and much of the ACT. She has chosen a palm husk to accentuate her display, significant because palm husks have been used for centuries by Aborigines as tools and artefacts in ceremonial gatherings. The horizontal shape of the husk provides a stable base for her table arrangement, allowing the eye to flow freely from left to right along her pathway of Australian natives mixed with striking exotic flowers that complement each other. Sophie chose her colour scheme to represent the importance of certain colours to the indigenous owners of our land, especially red. Red represents the red earth, red ochre and the spiritual relationship of the land to Aborigines. The colours of green and brown also represent the earth and the natural landscape while Sophie has added a touch of yellow to represent the Sun as the giver of life and protector. Event: Kick up your heels – 100 years of social dancing. 1930s – swing into the Second World War. Annette was inspired by Fred Astaire and Ginger Rogers for her very original creation of silhouette swing dancers, as they represent the grace, glamour and elegance of 1930’s dancing and fashion. She used an overlay of bundled flexi grass as arms to show the gentleman holding his sweetheart close for the last time before being shipped out. The couple’s faces are covered in pinned moss to represent their silhouettes in the fading light of what could be their last day together. The rustic paperbark dance floor symbolizes the fragmented world, while in contrast, the timber base represents people coming together to celebrate life. Annette chose a monochromatic/complementary colour scheme of pinks, greens and white to symbolize the tones of black and white movies and photographs of the 1930s. To create the gentleman's suit, Annette layered green leucadendron leaves to create his trousers, used pinned green cordyline leaves for his jacket and tails, and made his shirt from a clustering of white ti-tree. The lady’s gown was made by layering pink ice protea bracts for the bodice while the ‘pave’(French for “paved”, a technique where flowers are tightly packed together in a relatively uniform profile to create a rich texture) of pink and green blushing bride flowers created the sleeves and skirt to represent ostrich feathers and the dancers’ flowing movement. Event/inspiration: Afternoon tea on Barry Drive. Clare has used a tea cup and saucer as the base, and to symbolise the event. 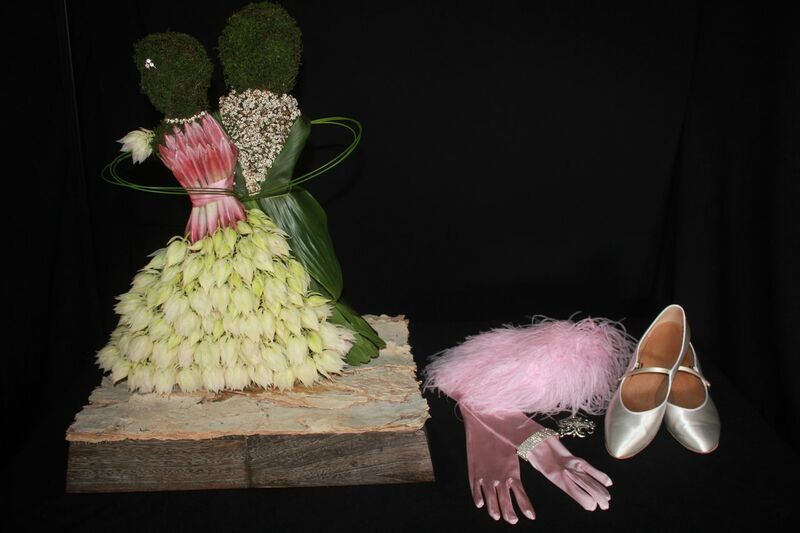 She has arranged flowers and foliage to symbolise the outdoor location of the event and the fact that Canberra is surrounded by a rich abundance of native flora. Red banksias and yellow everlasting daisy flowers are used to convey the brightness and warmth of Canberra, the setting of the event in the afternoon sun and also the native flora of the region. Event/inspiration: The gang gang cockatoo, which occurs in the ACT and is its faunal emblem. Emma used the colours of this bird – black, red and grey – in her design. 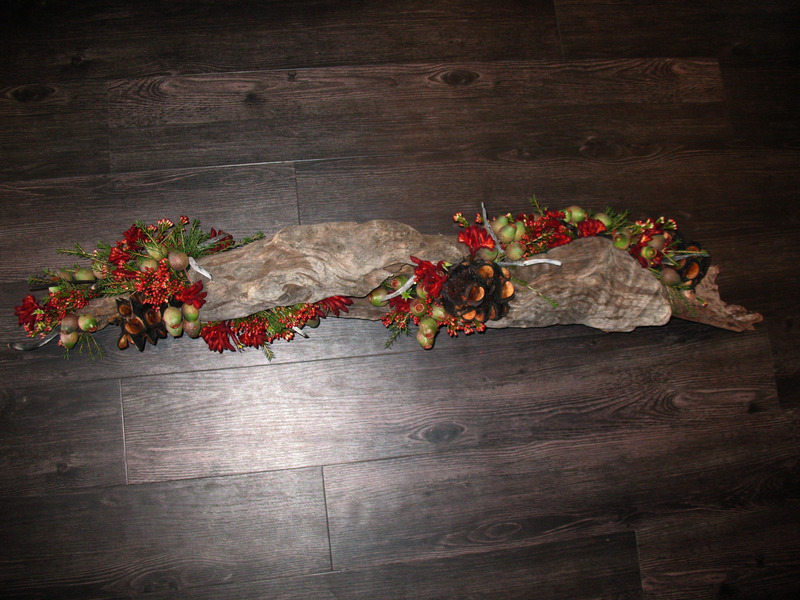 Her arrangement is based in 3 logs of different sizes, black and grey in colour, wired together like a jigsaw. Emma also wanted her work to feature contrasting textures and colours to reflect the Canberra landscape. The burnt banksia cone represents the colour of the gang gang cockatoo but also the black of the bush after a fire; while the reds of the kangaroo paws and bud wax represent new growth in the bush. The red kangaroo paws popping open depict the birds’ nests while the green gum nuts signify the green of the trees the birds live in. Event/inspiration: Burrunju Aboriginal Gallery – exhibition of indigenous art. 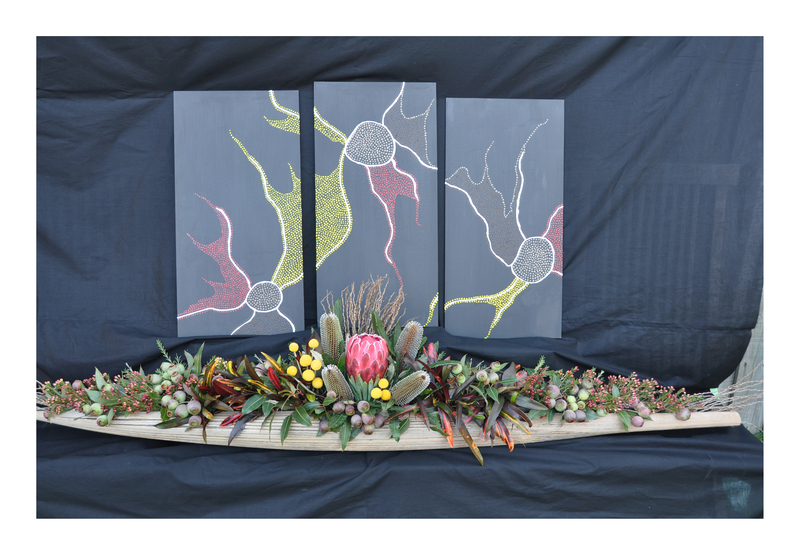 Tess designed an arrangement of flowers and foliages for an entry table at the gallery and aimed for her work to thank the indigenous people of Australia for their presence in our art and culture. Created as a long low arrangement, it was designed to be placed on a narrow table inside the front entrance of the gallery, placed against a black wall. The flower design runs the full length of the table and is low enough for the background painting (which Tess created to complement her flower arrangement) to be viewed. Tess chose floral materials that would reflect the dot or point style of applying paint found in many indigenous paintings – choosing gumnuts, billy buttons and bud wax. 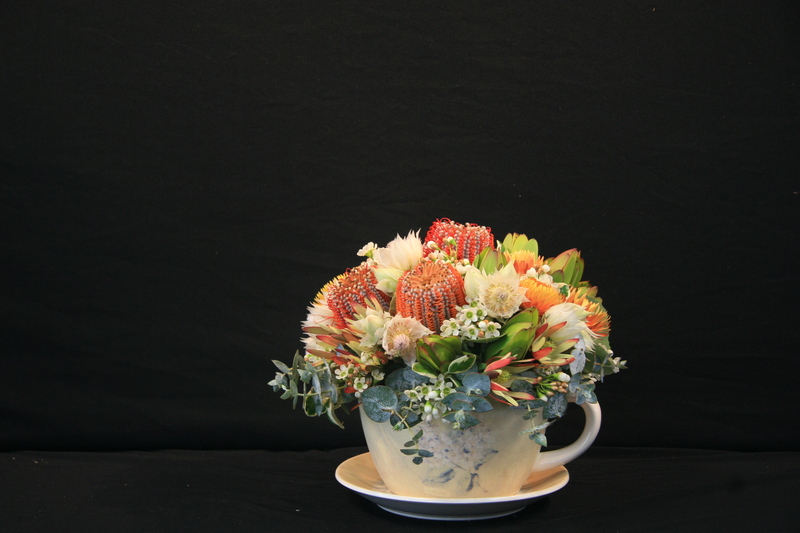 Her feature flower is protea, chosen because the petals look like paint brush strokes. The container used was a cocos palm seed frond to give the work a natural appeal, and to give a floating effect like a dug out canoe on a billabong. The main colours were red, plus green, yellow and brown, colours used by artists at the gallery and reflecting the natural landscape and the colours of the aboriginal flag.